"U.S. Army Quartermaster Contracts, 1861-1865"
(Lutherville, MD: Production Draft No. 1, May 2001). A total of 142 contracts for sack coats were found in the compilation. Some 25 were "For Making & Trimming," which represented open-ended contracts to construct coats from material already on hand. This was usually, but not invariably, material from Schuylkill Arsenal for coats to be delivered to the Philadelphia Depot. 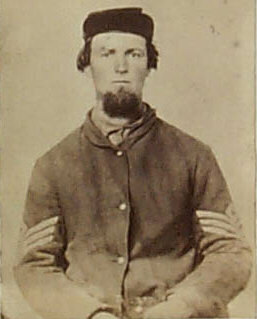 However, one contract with Bryant N. Lanhan dated July 1, 1864 for 12,000 sack coats to be delivered to Cincinnati specified the coats were to be "Made and trimmed in the same manner as those now being manufactured at the Clothing Manufactory in Cincinnati, Ohio; the blouse flannel and trimmings to be furnished by the U.S." His payment for each coat was not specified, and no note was found to determine the quantity he delivered. (Page 169)We know 145,883 "Blouses, Lined" and 116,051 "Blouses, Unlined" were made at the Cincinnati Depot between May 1861 and June 1865. Quantities made at other depot(s) are unknown to the authors at this time, but may be in a complete copy of the 1865 Quartermaster Report. The two contractors named "Lea" and "Lee" may be the same individual, since the dates of their contracts do not overlap. The one female contractor, Mrs. Moore, was noted in the special CW issue of Military Collector & Historian as the contractor of regulation gaiters now in Don Troiani's collection. J.T. Martin was the largest single contractor, with a total of 892,000 sack coats. One contract with Hunt, Tillinghust & Co. of New York City dated October 20, 1862 was for 20,000 knit sack coats, to be delivered to the Philadelphia Depot and paid for at the rate of $2.40 each. The description is for "dark blue knit blouses." (P. 142) This firm received numerous contracts for knit items, including drawers, shirts (a total of 481,258) and even uniform jackets (!) in addition to sack coats. Paul McKee illustrated what certainly looks like a knit sack coat in his article in Military Collector & Historian on the subject. 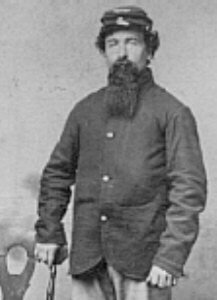 McKee, Paul, Military Collector and Historian, Notes on the Federal Issue Sack Coats, Page 50, Vol. XLVII, No.2 Summer, 1995, Washington, D.C.